LADCO supports our member states by performing regional air quality model simulations and transferring data and technical expertise for use within the states. Our modeling focuses on estimating urban to continental scale, ground level concentrations of ozone and its precursors, PM2.5 and its precursors, and acid deposition. July 2, 2011 Daily Maximum 8-hour Average O3 estimated by CAMx (LADCO 2011en). LADCO maintains a 200+ CPU Linux compute cluster with over 300 Tb of online data storage. We are constantly upgrading and expanding our computing capabilities to best support the technical needs of our member states. To supplement our on-site, enterprise computing infrastructure, we are migrating our modeling capacity to use on-demand cloud computing through Amazon Web Services (AWS). Fire emissions contributions to ozone in 2023 forecasted by CAMX (LADCO 2023en). LADCO works with our member state air agencies to develop and apply computer models of air pollution to support their air quality planning programs. The models we use simulate how weather, emissions sources, and chemistry in the atmosphere interact to produce air pollution. LADCO uses these models to both understand the causes of air pollution in the region and to explore air pollution mitigation strategies. The air quality modeling services we provide range from completed modeling studies and technical support documents through capacity building at the states to enable in-house modeling and analysis by state air agency staff. The air quality modeling systems used by LADCO are mostly open-source software. These systems utilize a powerful Linux computing infrastructure to support the computational and data requirements of the software. Along with high performance computing and environmental modeling, our staff has expertise in the processing and analysis of big data, environmental data visualization and Geographic Information Systems. 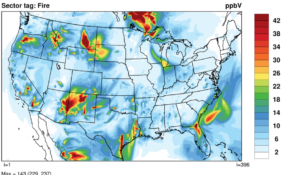 We leverage our understanding of the meteorology, emissions, and chemistry of the atmosphere, and how these processes are represented in the modeling software, to gain key insights into how we interpret and communicate the results of our model simulations. From the perspective of air quality planning, we use the models to investigate how emissions reduction strategies will impact current and future air pollution in the region. Single source, dispersion modeling is not an area in which LADCO is directly involved although this is an area of focus for our member state air agencies. How can I get access to the LADCO modeling tools and data? Visit the LADCO Modeling Results page to view graphics and download data from various LADCO modeling studies. For large data requests, contact our System Administrator with specifics about the modeling platform or data set in which you have interest. Contact the LADCO Air Quality Modeler for more information about air quality modeling at LADCO.